From March 1914 and through most of the summer Stapledon was working on a volume of poetry, Latter-Day Psalms, which was published three days before Christmas thanks to a delay in the binding, thus ensuring that it would miss the Christmas trade. It sold very badly, and the remaining stock was destroyed in the German bombardment of Liverpool in the Second World War. Starting in July 1914 he was teaching for the Workers Educational Association in North Wales. In the first week of August, students began to disappear, called back to shipyards or emergency duties. He returned home by steamer on August 15, and found that Liverpool had moved to a war footing. It is difficult to trace Stapledon’s mood during the early stages of the war: his diary, which he had begun in 1900, came to an end in the summer of 1914. When he wrote about himself in Julian Bell’s collection of reminiscences of Great War resisters in the 1930s, he summarised a period of great agonising. The story I have to tell is not one of heroic war resistance for the sake of a clearly apprehended ideal. It is a story of long and inconclusive heart-searching, of a deeply felt conflict of loyalties, and of a compromise which, though perhaps inglorious, was, I believe, at least an honest attempt to do justice to both claims as they were felt at that time by a thoroughly bewildered young man (quoted Crossley, 127). The methodical, low-key heroism of the Friends’ Ambulance Unit became legendary in France, but it was ignored in the English popular press (Crossley 128). I had no belief that killing, simply as such, must in all circumstances be wrong. It was war, modern war, that was wrong, and foolish, and likely to undermine civilisation. It was nationalism that was wrong, and militarism, and the glib surrender of one’s responsibility to an authority that was not really fit to bear it (quoted Crossley, 131). A member could be in the war but not of it, wear semimilitary garb but not carry a weapon, work alongside an army but be exempt from military orders. The FAU was, in the words of the narrator of Last Men in London, a “fantastic organisation,” and “anomalous organisation, whose spirit was an amazing blend of the religious, the military, the pacific, the purely adventurous, and the cynical (Crossley 131). His move to France was delayed by training, by learning to drive the ambulance, and an appendectomy. He took his ambulance to France on 1 August 1915. Letters home chowed that he soon learned the detachment necessary to drive fast, though enemy fire, with patients screaming at the back. His letters to his future wife were written with censorship in mind, of course; the bloodshed and suffering can be found fictionalised in Last Men in London. What Stapledon did record from 1915 to 1918 in the daily instalments of his correspondence with Agnes was the intimate life of the men of Section Sanitaire Anglaise 13, his group of fifty of so FAU drivers, mechanics, and medical orderlies attached to a French infantry division. Out of meals, walks, and books shared with colleagues rugby matches with French soldiers and souvenir hunting among the ruins of font-line towns; petty rivalries, frivolous mischief-making, and heart-to-heart talks about girlfriends and pacifism and psychology, the convoy created a microcosm of community within the larger world of warfare (Crossley 134). In whatever time he could find, Stapledon wrote, not just to Agnes, but poetry, fiction, and philosophy (a book called In A Glass Darkly, of which only one early manuscript fragment survives). He only published three pieces in the War, all in 1916. 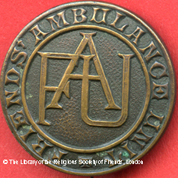 One, “Reflections of an Ambulance Orderly”, was published anonymously in The Friend; it argued that the FA should be kept going—which was eventually agreed by the Friends in the UK. In the winter of 1917-1918 Stapledon received his only injury: a kick to the head while playing fullback ion a rugby match with French soldiers, which put him in hospital for five days. Where he was stationed allowed him to miss the full force of the German offensive of 1918. He was fascinated by the diversity of the troops: Moroccans, African Americans, Bretons, Italians, Senegalese, Indochinese. In the final stages of the war Stapledon and the ambulance corps followed the French infantry into what had been German-occupied territory. He emerged unscathed, apart from a dose of gas; his colleagues were not so lucky. On 8 November he heard that he was one of four Englishmen cited by the French authorities for heroism under the most violent bombardment, and for being “careless of danger”; and he won the Croix de Guerre. After the war he threw it into a drawer, and forgot about it. For the above I am entirely reliant on the excellent biography by Robert Crossley, Olaf Stapledon: Speaking for the Future (Liverpool: Liverpool University Press, 1994).